Should you have a database, email marketing is one of the most effective ways to market webinars, provided the webinar is of interest to your list. When you send emails is critical. Although there are many statistics available about when is best to send an email, it’s best to check based on your previous results. Simply login to your email marketing software and check your past email broadcasts and see whether there’s a specific time during the day and a specific day of the week when people seem to be more responsive. In addition, if you are promoting a live webinar, it’s important not to promote it too far in advance as people are less likely to attend the webinar if they registered a long time prior. 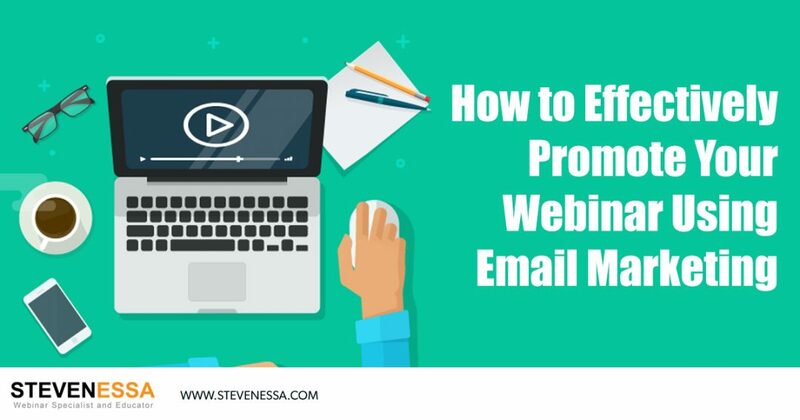 Ideally, for live webinars, it’s best to promote them 3 to 4 days before the broadcast, and send emails a day apart. As most people receive hundreds of emails a day, it can be tricky to stand out in someone’s inbox. Therefore, the most important element of an email is its subject line. The more attention-grabbing it is, the more likely people are going to open the email. Ideally, subject lines should be short and have an element of surprise or big promise, such as ‘Copy our top 5 best performing sales letters”. Subject lines perform even better if they are personalised, either by including the recipient’s first name or their location. For example, should you be promoting a webinar on sales techniques, and the recipient lives in London, one of your subject lines could be “Pauline, access the best sales techniques used in London”. The length of an email is very important. It shouldn’t be too long, as most people don’t like reading, or don’t have time to read. About 150 to 200 words is more than enough to include all the elements of an effective email. Remember, the aim of the email is to get people to click on your webinar registration link, not to register for the webinar. It’s your webinar registration page that will convert visitors into registrants, not necessarily your email. So the shorter the email, the most likely people are going to click on the link to find out more. In any marketing material, adding an element of scarcity is what pushes people to take action now rather than later. This is why adding scarcity to your email copy is important. The most common way to do it when promoting webinars, is by letting people know that there is only a specific amount of “webinar seats”. For example, most people who use gotowebinar to broadcast their live webinar, have a limit of 100 attendees. If that’s the case, make sure you underline it. We once reached almost 1,000 webinar registrants and at the time, our GoToWebinar account could only hold 100 attendees. We used this fact to entice more people to register, so if they didn’t make it to the live webinar on time, their name was still on the list for the replay. If you are promoting a webinar replay in an email, let them know that the replay will be pulled down after a few days (say so, only if it’s really the case!). As mentioned in section 3, an email is meant to sell a click to a link, nothing else. A successful email, is an email that has generated clicks. Therefore, not only the email copy should point towards the link, you should make sure the link features 3 times in your email. In fact, it should feature at the beginning, after a sentence or two, as most people tend to read the beginning of an email only. It should also feature after in the middle of the email and at the end in the “P.S” section. High performing emails usually have a P.S section which summarizes what has been said in the email, for people who tend to scroll all the way down before reading an email. By adding a link right at the end, you’re most likely to get the people who scroll through an email, to click your link. Lastly, adding social proof to your email copy is key, as people tend to follow other people’s action. If you have any testimonials from people who have attended your training previously, make sure you include it in your email. Alternatively, if you’ve had many people register, don’t be afraid to show a screenshot of the number of people who have already registered. This will entice more people to want to register too from fear of missing out. Another way to display social proof is through social media. Publish a social media post about your webinar, and wait for engagement. If engagement is low, you can boost your post by paying for advertising for more people to see the post, and therefore engage with it. Then, you can include a screenshot of the comments made on your post and include it in your email as social proof. Another fantastic way to display social proof, is by using the media. If you’ve been featured in the media, you can include it in your email by either showing pictures of you in the media or simply making statements such as “as seen on TV”.